I haven’t seen much lazy this summer, and I have never seen hazy Florida humidity as visible as in these photos. It was steamy out at the clothesline today! I have seen plenty of “crazy,” but I’m not even going to start on that. In earlier posts, there has been discussion about the utility end of sewing. Not everything we stitch is beautiful or creative or unique. Sometimes it is just what is needed. And according to my daughter, her children needed laundry bags. So that’s what I sewed. Her reliance on a laundry bag began when she was a freshman at University of Florida. Into her second week there, she phoned with an SOS that the basket was not adequate for her laundry. She needed a bag. This was made in a hurry from a very sturdy cotton decorator fabric. With no embellishment other than a strip of Swiss embroidered edging and a piece of ribbon, it has served her for 16 years! From Gainesville to Paris where she studied at La Sorbonne to the first house she purchased as a career girl, then to her safari through Africa and hike to the top of Mt. Kilimanjaro and lately to the home she and her husband now share with their children, this laundry bag has toted her dirty clothes to the washing machine and back. That is one sturdy bag and one neatnik young lady who likes her “stuff” bagged up. 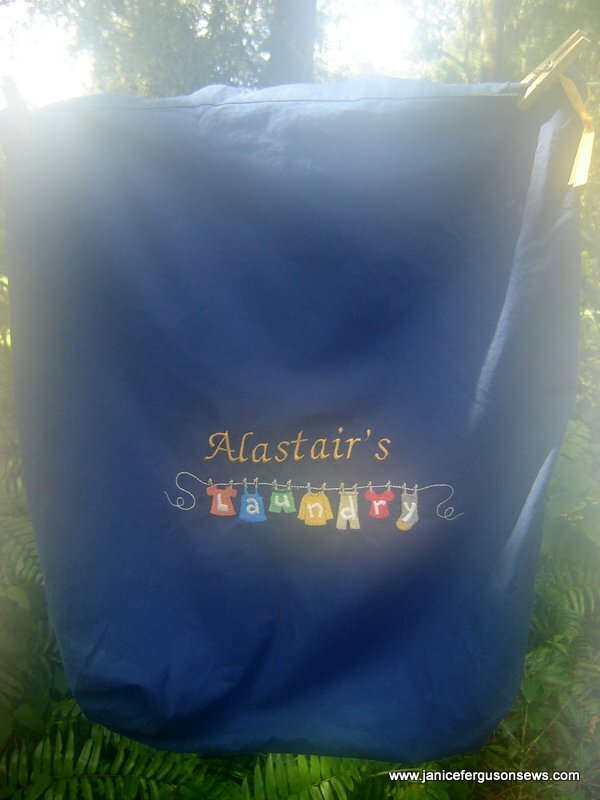 Recently, when her 4 year old Alastair spent several days with us, his mother asked me to make him a laundry bag. At home, he dutifully stuffs the hamper with his dirty clothes, but there is no designated place when he is away from home. Made of a heavy poplin, the bag is squared off at the bottom so it can stand more easily when it is full. A cute design from Embroidery Library along with his name personalized it. Now, Rebecca has asked me to make one for baby Vivian Rose. This was really a fun little project. Recently, while chatting with a reader, Linda, we confided to each other that we both spend way too much time planning even a small project. I shared that I often spend more time at the computer setting up an embroidery design than stitching it out. Which is just what I did on Vivian Rose’s bag, made of a sturdy pink twill. 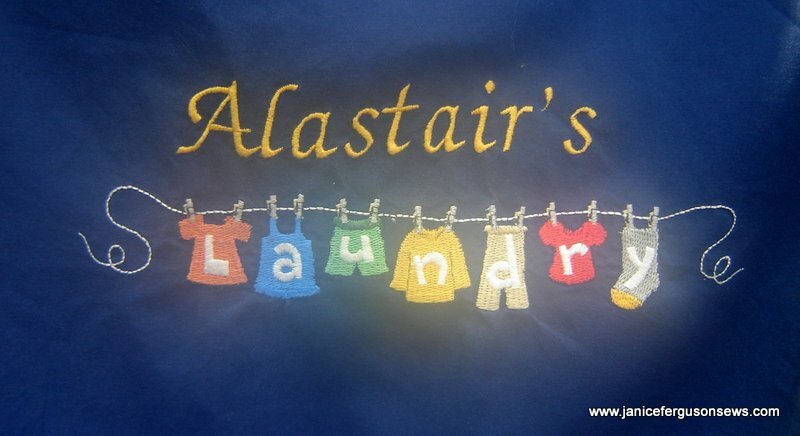 The clothesline from Alastair’s bag was extracted and then tiny girlie garments were appliqued to that line. 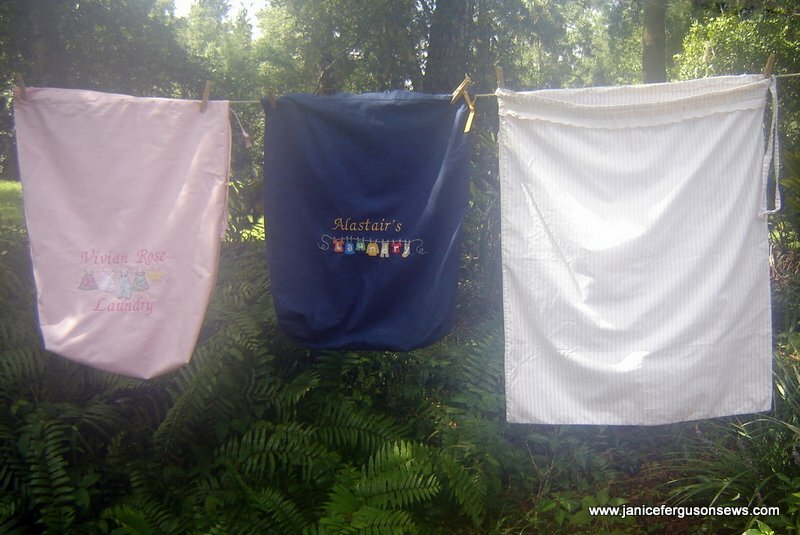 At first, I couldn’t find doll clothes designs that were small enough to fit on the clothesline. But then remembered Sue Lord’s wonderful machine embroidery collection, Book Babies. A soft fabric book holds pages and pages of set ups for tiny felt babies, including an armoire to hold their precious little clothes. I tell you truly this collection is to-die-for! I wish I could direct you to Sue’s site to look them over, but it seems to be down. Sue, if you are reading this, are the designs still available from you? 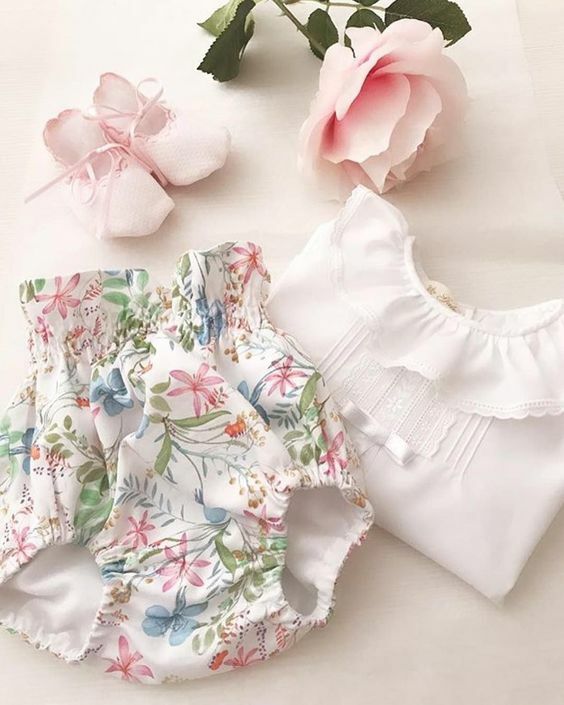 They the were perfect size and include daygowns, smocked dresses and pretty heirloom style clothing. It took some fiddling to place them on the clothesline just so. Next, I extracted the clothespins from Alastair’s design and positioned them to hold up the garments. Note the ugly hemline of white dress. But back to those lazy days of summer. We have just spent a wonderful week at the beach with our family. Sand castles, boogie boards, pool time and beach walks have made this a magical time for all of us. 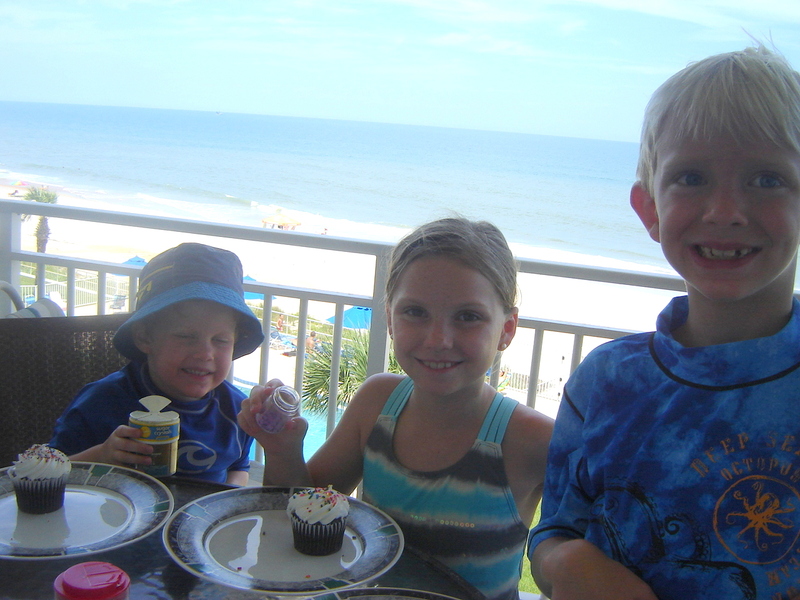 The children decorated cupcakes for Robert’s 8th birthday. He was fascinated with his birthday present, a kit with instructions for making more than 100 electrical circuits that turn on lights, make music and send a whirling fan into the sky. Though it is labeled as age appropriate for 8-108, Alastair was as intrigued as his older cousin. Meanwhile, Vivian Rose charmed one and all. She wore at least 3 smocked outfits every day, including this old thing that her mother wore 33 years ago. She loved the surf and sand, the wind and all the activity. I hope you all have had a summer full of lazy, hazy, crazy days and can enjoy a few more before the season ends. 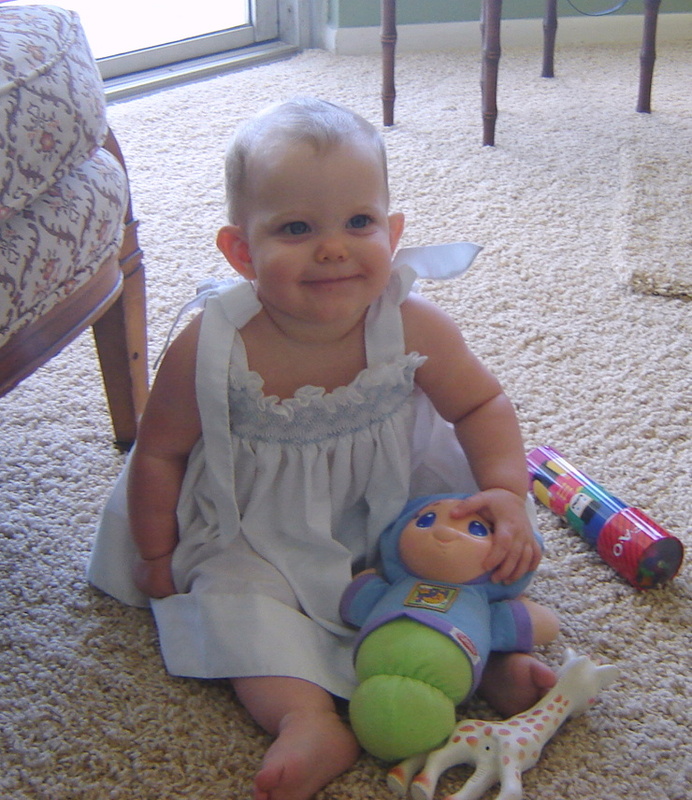 This entry was posted in baby accessories, bags, machine embroidery, Nana fun. Bookmark the permalink. Terrific laundry bags and I can relate to spending more time planning than stitching! 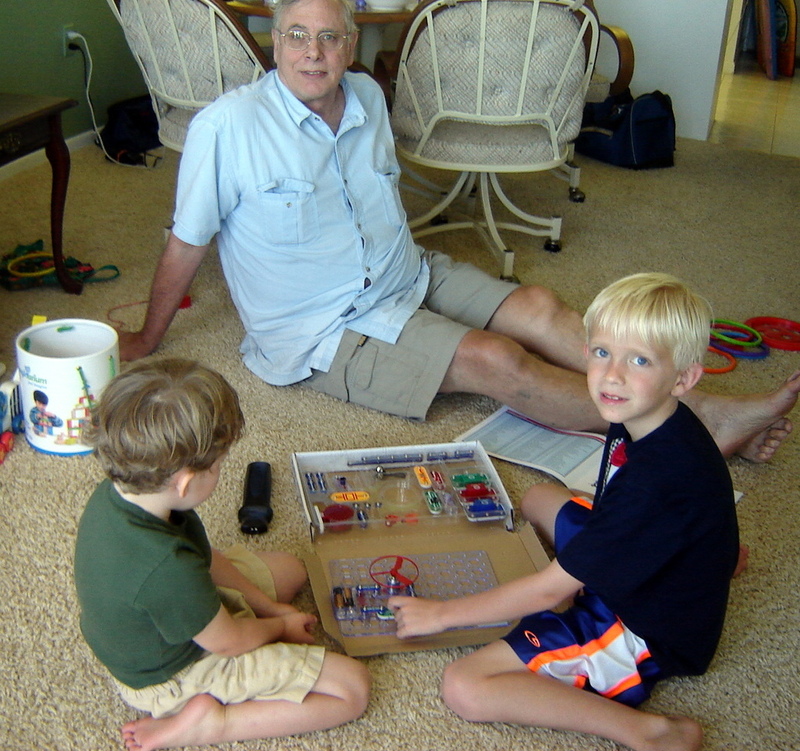 My kids all love the Snap Circuits, too. Great learning toy! What cute bags! I’ll have to do that for my one and only granddaughter. I just bought an embroidery machine so am keeping busy learning the software. I’m stitching out a stock design in all white for a nightgown as I write this. And you’re right, it seems that I spend much more time at the computer than actually sewing. Thanks, Debby. If these bags last half as long as Rebecca’s has, they will have stood up very well. But I doubt that a teenage Alastair will be toting this bag with him on a Boy Scout camping trip. I think we all enjoy that planning stage of a project. 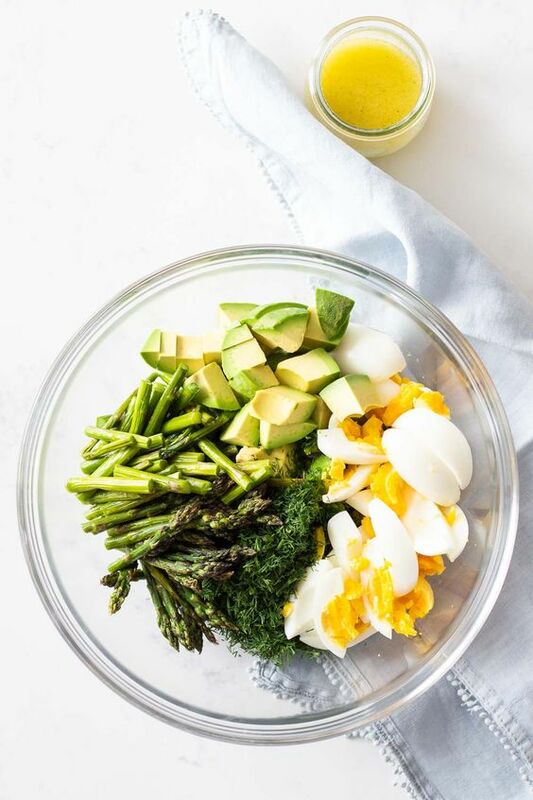 When we are finally done with that, the finished product is so much more to our liking than if we had just whipped up something quick. The Snap Circuits were a real surprise to me. Not only does Robert absolutely love them, but 4 year old Alastair looked at the diagrams and put together a few on his own. Now, he wants a set. What a great, educational toy! Cynthia, I am SOOOO happy to welcome you to the world of machine embroidery! 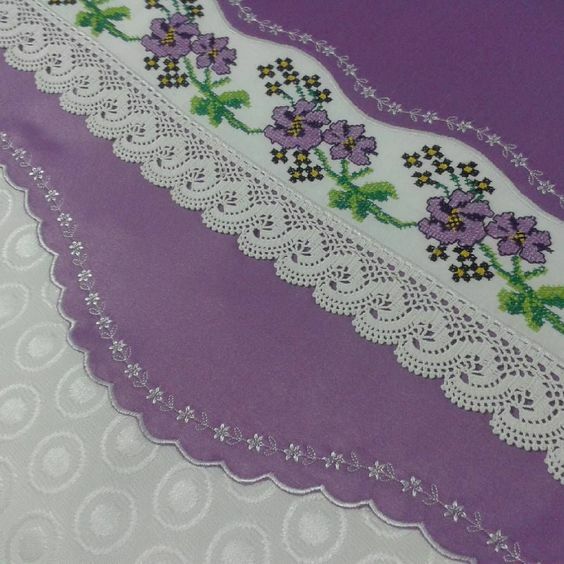 With the extraordinary hand embroidery that you do, you can delegate projects of lesser importance–like laundry bags–to the machine and save your hand stitches for more delicate items. You will love making quick, contemporary things for your little granddaughter. Hurrah for you! Janice, I love your laundry bags! While reading how these came together, my first thought was how much time I would spend getting the details just right…and am so glad to hear I’m not the only one who would first fiddle a bit and ponder. In any case, all of your planning and thinking paid off on these, because they are perfect…perfectly perfect : ). Your blog is beautiful!! Especially the eyelet floral background piece. I just found your site – what a lovely place to spend time, and enjoy your sewing projects and ideas. Thank you for sharing so many cute things. You’ve inspired me to make a cute laundry bag! Linda, we plan and execute our sewing plans in just the same way. I’m embarrassed to tell you that I made another pink bag before this one, but I wasn’t happy with one of the appliques, so I started over. 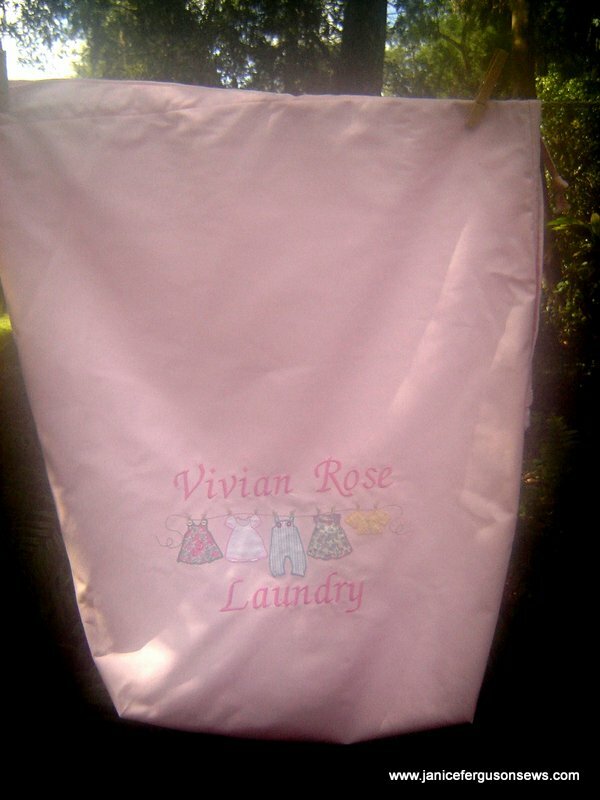 I guess that will be Vivian Rose’s back up laundry bag, not to be taken away from home! We need to start a chapter of Sewing Fiddlers and Ponderers Anonymous. Will you be president? Thank you, Beverly, for your kind words. I was happy to read that you like the background pattern. This is an antique bassinette skirt that I converted into a valance for the nursery. My daughter thinks the background is too busy so I’ve been thinking about putting up another. I think I’ll wait on that a while longer. You are so kind to leave your comment. I hope you will visit often. Aren’t you the clever one!!! 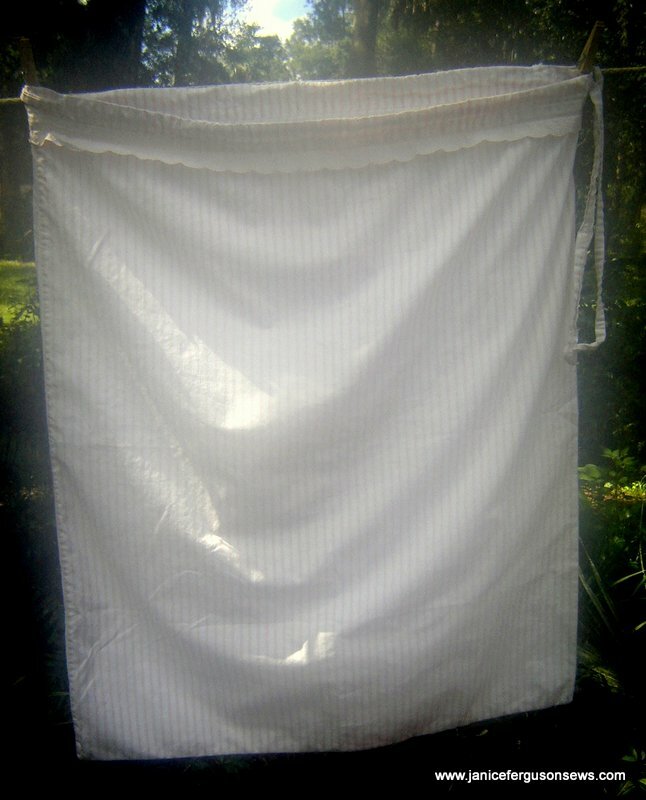 Fancy Laundry Bags….somehow my mind just doesn’t go there but who knows…..you just might have put some ideas in my head! 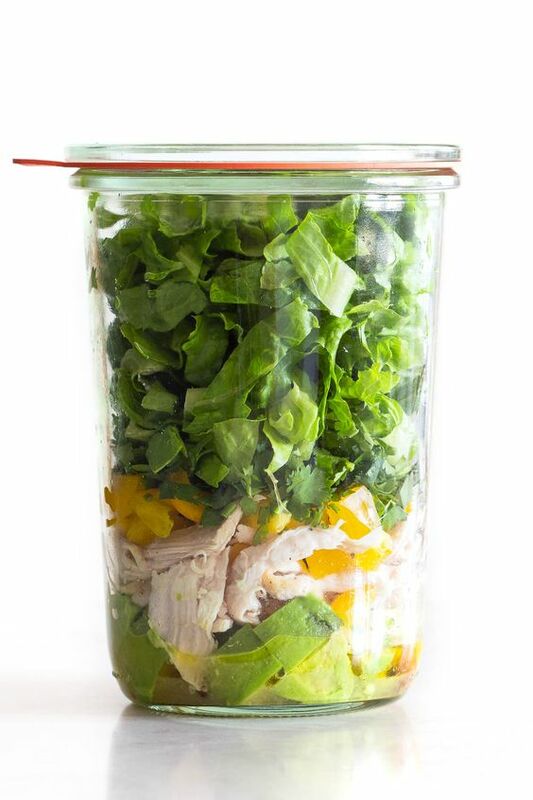 Shirley, Shirley, Shirley—I cannot imagine you making ANYTHING plain! So “fancy” laundry bags sound like something right down your alley. Would you really make an unadorned denim bag for your granddaughter’s dirty clothes? I think not.